Hello! 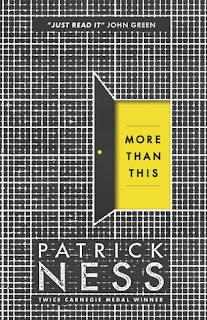 I had a sudden urge today to upload a book review, so I thought why not do one on Patrick Ness's " More Than This? 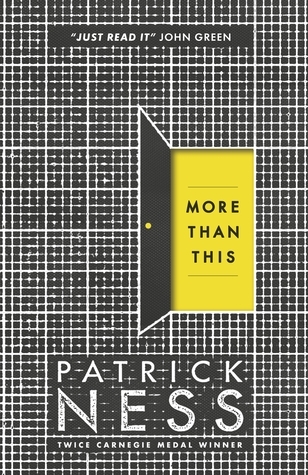 I recently finished this Young Adult book that revolves around a teenage boy who seems to be all alone in his world. In this review, I won't be discussing the plot much, for fear of giving something away, but rather the general style of the book. I can't say that I loved the book- because... I didn't. But it wasn't bad. The beginning of the book is full of suspense, and for five Chapters, all you know about the main character, is that he's a boy. He's simply referred to as " him". The beginning is a little slow, but once you get into Part Two ( the book is divided into Parts 1-4) you get really hooked. The suspense builds as Ness leaves the readers a chance to guess what happens at the end of the book. I personally don't like this style, but I know a lot of people who love to be imaginative when it comes to books they're reading. There is no Epilogue, but if you look online, you'll find thousands and thousands of fanfictions, each depicting what different people believe would be the end of the story. If you're looking for a heavy, deep book, then this isn't the book for you. It can be considered a light one, although it does involve a certain degree of romance and emotion. I'd suggest More Than This for anyone who's finding it hard to get into reading. Even though sections 1 and 4 aren't great, I promise you'll love how thrilling and gripping sections 2 and 3 are. If you're new to reading Young Adult books, let these two sections give you a glimpse of what other books are like, before delving completely into one without knowing what you're in for. The plot of this Post- apocalyptic Young Adult Fiction, will have you shocked! I'm currently reading Patrick Ness's " Knife of Never Letting Go" from his award winning Chaos Walking Trilogy. Let me know if you'd like me to do a review on the book, or even on the trilogy!